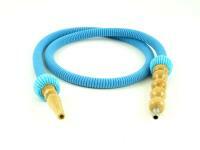 One can use the hose with outer and inner plastic mouthpieces and filter mouthpieces. This hose is not washable. For optimal smoke enjoy, wash the hose 1 x per month, more importantly if you smoke different flavors, since the taste in the hose settles. TIP: Buy an extra hose for your favourite tobacco flavor. Shisha hoses should be replaced 1x per year.